The Stamina 15-9003 Deluxe Conversion II combines a recumbent exercise bike with a rowing machine all in one! 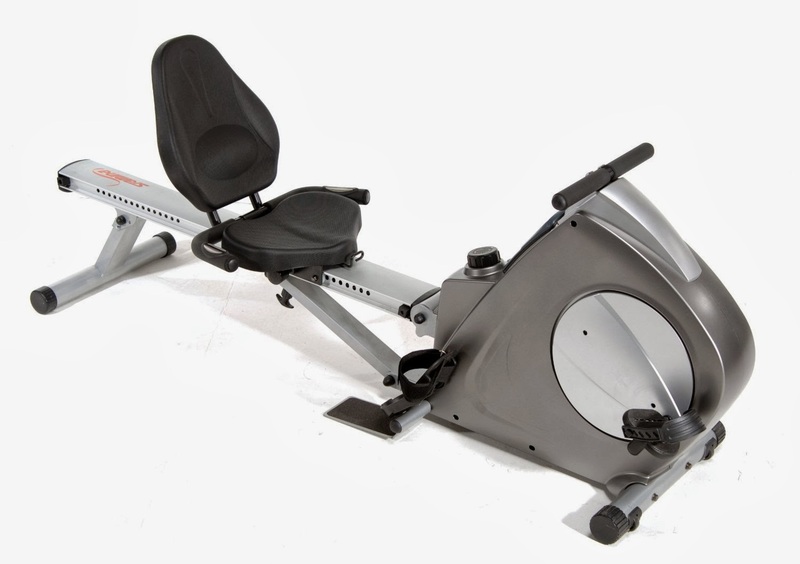 If you like the idea of both cycling and rowing but haven't got the space for 2 separate machines, then this Stamina 15-9003 2-in-1 machine is just what you need, saving you both space and hard earned cash! Switching between the bike and the rower is easy and hassle-free. The Stamina 15-9003 Deluxe Conversion II Recumbent/Rower features a recumbent bike seat which helps to support your back while you exercise. This type of seat is ideal for people who have a weak back or who are recovering from injury but have been advised to exercise. In addition to cycling and rowing, the Stamina 15-9003 features a Top Bar to enable you to perform additional upper body exercises including bicep curls, forearm curls and tricep kickbacks. There's also an additional resistance cord that can be attached under the seat to enable you to perform light leg presses. The Stamina 15-9003 Recumbent/Rower utilizes smooth and quiet magnetic resistance with 8 levels to choose from so you can work at your own pace and build yourself up. An electronic monitor with an easy-to-read LCD display is included with the Stamina 15-9003 so you can track your workout progress, including time, distance, speed, calories burned and pulse. · Just 30 minutes cycling on an exercise bike can burn between 207-345 calories for ladies, or 252-420 calories for men, depending on the intensity of the cycling. · Just 30 minutes rowing on a rowing machine can burn between 262-449 calories for ladies or 310-531 calories for men, depending on the intensity of the rowing. · 2-in-1 home gym exercise machine – recumbent bike and rowing machine. · Constructed with sturdy steel, together with an extruded aluminium rowing beam. · Features a Top Bar which enables you to perform additional upper body exercises including bicep curls, forearm curls and tricep kickbacks. · As well as the Top Bar, there is an additional resistance cord that can be attached under the seat which enables you to perform additional light leg presses. · Electronic monitor features a large LCD screen and enables you to keep track of your workout progress. · Workout progress displayed includes: speed, time, distance, calories, and pulse. · Measures your heart beats per minute via hand-pulse sensors that are build into the hand-grips. · 8 levels of smooth quiet magnetic resistance. · The recumbent seat is built for comfort with molded foam-padding and a backrest to support your lower back. You can use the seat to glide back and forth with the rowing machine or stationary for the bike. · All the pedals on the Stamina 15-9003 have foot straps for safety and to keep your feet from slipping. · Folding frame for easy storage and transport wheels for easy portability. · The maximum user weight limit advised for this machine is 250 lbs. · The machine itself weights approx. 105 lbs. · The overall size of the machine measures approx. 74.5” long x 10” wide x 25.5” high. The Stamina 15-9003 Deluxe Conversion II Recumbent/Rower really is an amazing machine for the money. You get the benefit of cycling and rowing on one machine, saving you money and floor space. It’s well constructed and offers a smooth and quiet workout, enabling you to watch TV or listen to music while you exercise. The benefits of cycling and rowing to your health and fitness regime are numerous. Both cycling and rowing are low-impact forms of exercising which means that they exert less impact on your body and joints than other forms of exercise. · Cycling is a great cardiovascular exercise, and gives your lower body a good workout, strengthening the muscles in your legs, hips, thighs and buttocks. · Rowing is a great aerobic exercise which works the entire body, strengthening all the major muscles in your legs, arms, shoulders, abdominals and buttocks.